Extensive video and text interview with the spirit of the Zelda series. If you're going to start working in games development, you might as well begin on one of the greatest games of all-time. 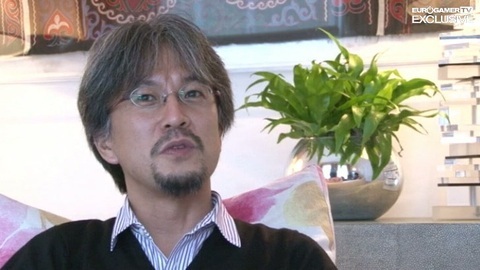 That was the rather serendipitous position Eiji Aonuma found himself in, hired by Nintendo to work on the momentous first 3D instalment of the Zelda series. Since then, Shigeru Miyamoto has taken a step back to allow the designer to direct the series for over a decade now, creating a string of classic experiences across multiple platforms. The next, Spirit Tracks, is out on DS next month, while Nintendo beavers away in secret on Link's first bespoke Wii adventure. In London last week to promote his new handheld game, Eurogamer snagged a rare one-on-one audience with the manager of Software Development Group No.3 in Nintendo's fabled EAD division, to discuss his career, the relationship with Miyamoto, and what's coming next. Watch the interview on video or scroll down for the entire transcript. Eurogamer: Let's go right back to the beginning. What's your earliest gaming memory, and when did you decide you wanted to become a game designer? Eiji Aonuma: My first encounter with any videogames in my childhood was Game & Watch, the series of portable games products launched by Nintendo. I was amazed by knowing that within such a small LCD screen such an awful lot of different things were able to be done. That was my first memory of any videogames. Since then, however, I do not have any recollection of what kind of games I was deeply into. I hardly played with any before I was grown up, even though a lot of my friends and people around me were already playing with Nintendo Entertainment System. As a university student, I was more excited learning about the arts and wondering whether I should be an artist or not. In my university and grad school days I was thinking what I should do in my life, whether I would be an artist, or whether I would like to do something else. I wanted to surprise people in a meaningful way, and I decided that as the theme of my life - and I happened to know there was a company called Nintendo whose job was also to surprise people in a meaningful way. That's why I became interested in joining the company, and the company hired me. At that time I was not thinking about becoming the game creator myself. I thought I was probably hired because the company was interested in me as a product designer, because that's what I studied at university. It was only afterwards I learned something about The Legend of Zelda, and when I started playing it I was deeply into it and surprised by the potential of videogames. I didn't know that so many things could be done! And later on Mr Miyamoto gave me the opportunity to work on Zelda, which happened to be Ocarina of Time - and before I knew it exactly 12 years have already passed! Eurogamer: You started on Ocarina of Time, and your first Zelda game as project lead was Majora's Mask, which was a different take on the series. Was it difficult to leave your mark on something already so well-established and well-known, that already had Mr Miyamoto's stamp all over it? Eiji Aonuma: In fact, in my mind I did not think that Legend of Zelda was already an established franchise, especially because Ocarina of Time turned out to be the very first 3D Legend of Zelda. So I thought there were many things we were able to explore and in fact many people, including Mr Miyamoto himself, were looking forward to the new directions future 3D Zeldas could take. And it was actually Mr Miyamoto who wanted to take the same engine as Ocarina of Time, yet try to make something really new. That mission was assigned to me by Mr Miyamoto. So taking on the assignment itself was not that difficult. The most difficult part was when Mr Miyamoto told me: 'you've got to finish it within one year'! And at first I was quite at a loss what to do: what we could do with the Zelda franchise within just one year? And then there came help from the Ocarina team and we were able to use the same team members who already had experience of working on the same engine, and also Mr Miyamoto advised us to think about anything that was left undone during the development of Ocarina. So we focused on the time mechanism already included in the Ocarina engine and decided that we should focus on the three-day system. And by adapting it so that everything would reset if the game cannot be completed within three days, I think that we were able to come up with one idea after another which made for a very fast-paced, excited game. As I really wanted to surprise people in a very meaningful way that was something which suited my own desire. And even though we had to tackle the challenge of completing the game in one year, it was actually an exciting challenge and I felt the team could make it. Link makes his hugely anticipated GameCube debut. A terrible fate has never looked this good.